Solar 21, based in Rathcoole, Co. Dublin, already has 21 people working for them. 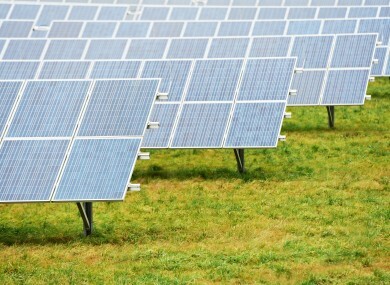 File image of photovoltaic solar farms across Europe. SOLAR 21, AN Irish Renewable Energy Investment company, has announced plans to recruit 25 new people between this year and early next year. Based in Rathcoole, Co. Dublin, the company was set up nearly four years ago and now has 21 people working within the group in Ireland, in addition to its employees based in Germany and Italy who manage the solar farms. With strong demand from Irish investors, Solar 21 has successfully established a fund of close to €150 million investing in photovoltaic solar farms across Europe. The Solar 21 Group is specifically looking for experienced financial services professionals who are looking for a change from their current role. Michael Bradley CEO of Solar 21 with Andrew Bradley CFO. “We already have a highly experienced team and our goal is to build on our reputation for delivering strong returns in a safe and secure solar investment fund. This is a demand-led expansion that reflects the growing interest in this type of secure investment,” said Michael Bradley, CEO of Solar 21. Email “Solar investment business to hire 25 new people in Dublin”. Feedback on “Solar investment business to hire 25 new people in Dublin”.